The very first step is to get yourself a Neti Pot. There are a number of styles available and they are made of different materials, ceramic, plastic, copper, and stainless steel. Each has its own advantages and disadvantages, so you will probably want to look them over and decided which is best for you. The ceramic Neti Pots are very popular and the Himalayan Institute Ceramic Neti Pot is one of the top selling neti pots available. This is because its shape allows for optimum nasal irrigation. This pot is decorative and has the lotus design on the side. You can read our full review here. Another very popular ceramic Neti Pot is the Ancient Secrets Ceramic Nasal Cleansing Pot which is the one I own. I really like this one because it is ceramic and easy to keep sparkling clean. It’s also reasonably priced – you can get one on Amazon for around $10. Some ceramic neti pots can tend to be heavy. Because of the added weight, they usually aren’t as big meaning they need to be refilled mid-way through the process. However, I have a smaller neti pot and I personally haven’t ever found this to be a problem. I also have a plastic Neti Pot which I use when traveling. I bought it as a kit from Walgreens when I was in Las Vegas. It came with 30 saline packets. 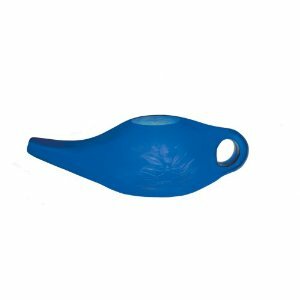 These neti pots are inexpensive and light weight, and although they are generally not in any way aesthetic they do the job they are designed for. Neti pots made of copper are usually expensive, but they do come in larger sizes. The copper tarnishes easily, therefore loses its appeal in a short time. Stainless steel Neti pots are clean and very clinical looking. That may be a plus from some viewpoints. Others may not like that aspect at all and prefer something a little more decorative. Using a Neti Pot is easy. With very little practice, it becomes easy as washing your face or brushing your teeth. It can be used over a sink or in the shower, over a bowl on the table or even outside. Wherever is comfortable or convenient for you. Warm some purified water or use tap water that is warmed to a temperature similar to formula in a baby bottle. Test it on the inside of your wrist for a comfortable temperature. It should not be too warm or too cold. Some say that you should have the water temperature as warm as you can stand but I don’t think that’s necessary and it may do some damage if you have it too hot. Fill the pot with the water you just warmed and add ¼ teaspoon of good quality sea salt. Neti Pot Salt in loose form and sachets are available online and this is an ideal way to know that you are using certified, good quality salt. I like the saline packets from Walgreens neti pot kit I purchased as at least I knew I had the recommended dose. Swish the water and the salt until the salt has dissolved completely. Lean forward over the sink so that you looking into the sink. Now turn your head so that you are looking over to your left. Be sure that your head and shoulders are over the sink. Keep you head tilted forward so that the water will run out the other nostril instead of down your throat. Place the spout of the Neti pot just inside the opening of your left nostril, not too deep, but just enough to prevent the liquid from spilling as you pour. Just relax and open and breathe through your mouth. Make sure you do this otherwise you will swallow most of the liquid. Slowly pour the warm water into the left nostril. Allow it to flow through the sinuses and out through the right nostril. The sensation may feel strange at first, but you will get used to it. Continue pouring until half the salt water is used. Then remove the pot from that nostril. Switch sides, now tilting you head forward and your face to the right, keeping your head and shoulders over the sink, and insert the spout into the right nostril. Use the same procedure, pouring the salt water and letting it flow through and out the left nostril until all the salt water is used. Remove the spout from that nostril. Very gently blow your nose at this point, realizing that much mucus will have been loosened and will come out. This is usual and is desired. Make sure you don’t blow your nose too hard. I found that if I blow my nose too hard it causes my ears to block and pop. It really is that easy. It may take a few attempts to get it right but after just a few times, this can become part of your daily routine. It’s fantastic for people with sinus issues so well worth trying.